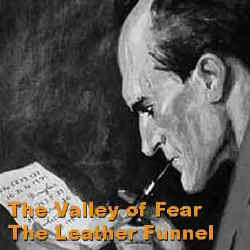 The Leather Funnel by Sir Arthur Conan Doyle, narrated by Patrick Horgan. The Leather Funnel is a short and intriguing tale of mystery and horror set in Paris, France. It would not be fitting to say too much about it here ... except, perhaps, that it is not part of the Sherlock Holmes canon and that it involves the Marquise de Brinvilliers. It is included as a bonus story with The Valley of Fear CD but is not included in the complete Sherlock Holmes collection on DVD or thumb drive.